Draw Ceremony at Country Music Hall of Fame in Nashville, Tennessee, April 5, 2018. After a pre-draw concert byTwo Story Road, a duo consisting of Belmont alumni Brandon and Jamelle Fraley, rocked the stage at Nashville’s Country Music Hall of Fame, the tennis stage is now set for this weekend’s Davis Cup World Group quarterfinal between the U.S. and Belgium. John Isner, the hottest act in American tennis, was announced as the Americans’ No. 1 singles player, and will open the tie on Friday against Joris De Loore, the Belgian No. 2. In the reverse of that matchup, Sam Querrey, the American No. 2, will face Ruben Bemelmans to close out the opening day of play on the indoor hard courts of Belmont University’s Curb Event Center. Saturday’s doubles match will feature Jack Sock and Ryan Harrison for the Americans, as they take on doubles specialists and familiar partners Sander Gille and Johan Vliegan. If the tie is still undecided, Sunday’s finale will begin with Isner taking on Bemelmans in a battle of No. 1s, followed by Querrey against De Loore. Coming in as strong favorites on paper, the Americans will look to 6-foot-10 Isner to stake them an early lead. Isner, coming off of his first career Masters 1000 title in Miami, will look to ride that momentum into the weekend. On hand for the draw ceremony was USTA Chairman of the Board and President Katrina Adams, and her Belgian counterpart, Andre Stein. They were joined by Tennessee Governor Bill Haslam and the president of host-site Belmont University, Bob Fisher. Tie referee Norbert Peick completed the draw after a brief welcome from Carlos Bravo of the ITF. On Wednesday, Nashville Mayor David Briley declared Friday “Davis Cup Red, White and Blue Day,” as the city gears up for the weekend event. 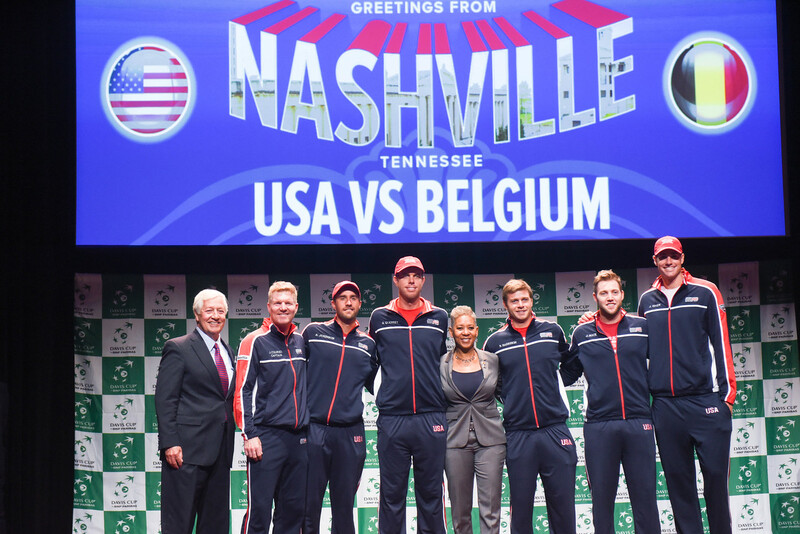 It is the first time the Music City has hosted the Davis Cup since 1978.